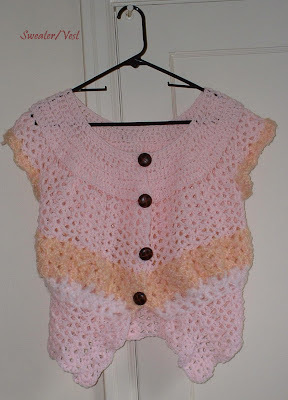 I was sifting through some old photos and found this crochet vest that I had forgotten about. Back in 2001-2002 period when I was working part-time jobs, and hadn't welcomed Ana yet, I had enough time to crochet to my heart's content. This was mainly an extrapolated version of a baby layette pattern, except, I crochet happily about half way through and then decided to shape it a little more flatteringly (if that is possible), making up the pattern as I went.